Keeping It Simple. 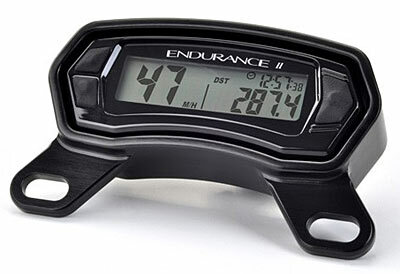 The Trail Tech Endurance II digital gauge offers speedometer with distance and time, boasting a clean, simple design with the most essential riding information. The Endurance II features two independent odometers and records accumulated ride time and trip time, along with maximum and average speeds. The backlit segmented display makes it easy to view information on multiple screens, ensuring the stopwatch and maintenance reminders are easily accessible. 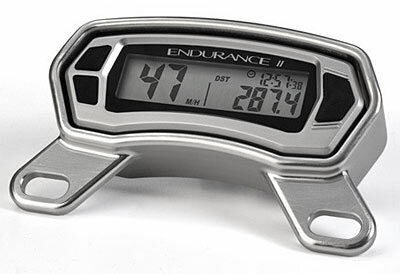 The Endurance II is the ideal digital gauge for the minimalist or custom bike builder, due to its small size. Whether you’re looking to stay legal or stay informed, Trail Tech Endurance II has you covered! (Computer sold separately) With 3 brackets included in this kit, this Endurance II protector fits a wide range of vehicles. 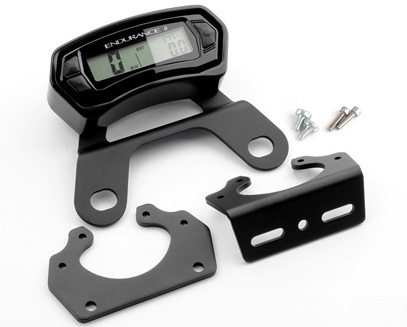 The Top Mount protector was design to fit using the front two bolts on the bar clamps and fits a wide verity of motorcycles with bolt spacing between 90-106mm (3.55" - 4.17"). (Computer sold separately) The Top Mount protector was design to fit using the front two bolts on the bar clamps and fits a wide verity of motorcycles with bolt spacing between 90-106mm (3.55" - 4.17"). Trail Tech's Endurance II is an economical, fully functional speedometer with model specific applications. Features include current, average and maximum speed, full time back-light, two independent trip odometers, riding and trip time, accumulated riding time, stop watch, and maintenance reminder. 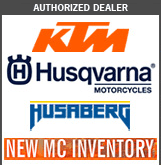 Endurance II Kit includes: Magnet Kit (100-01), Wheel Sensor (101-06), Mounting (2000-BCA), and Power Lead (9000-1011).